Not much of a story I'm afraid here. 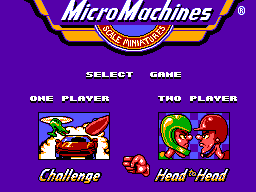 There are several modes of play which are challenge, head to head and two player. The challenge mode allows you to win different types of cars to create your own collection of Micro Machines. This is done by completing races around various household objects. In head to head mode you must try to get one screen length between you and your opponent to score points. The two player mode is the same as the head to head mode only two players can compete for the points. I find the game to be very enjoyable, especially with two players, which keeps you coming back for more. One of the major points that I noticed in the game is how fast it is. This makes it exciting and really tests your reflexes (oh, the amount of time I've missed a corner and gone straight into a hazard). The opponents are also worth a mention as later in the game they produce a good challenge to even the best driver. Although I assume their AI is simple path finding they do seem to ram you into obstacles too. One of the games major strengths. For the Master System the graphics are amazing. With bright vibrant colours that really help the courses come to life. It could be mistaken for a Megadrive game. 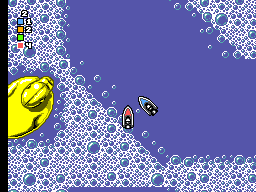 The game also boasts some smooth screen scrolling and there is no sprite flicker either. Again despite the Master System's sound capabilities not being great Codemasters have put together an assortment of catchy and fun tunes that never get boring or irritating. The sound effect can be a bit on the weak side with the engine sound seeming a bit pathetic but on the whole they are okay and suite the game well. The controls for this game are easy to learn. The D-pad controls the steering, button 1 is the accelerator and button 2 is the brake. This makes it accessible to even those who may not normally play video games. This makes it a fun party game when the relatives are round. The lastability is high. The game starts off with some easy courses but soon both the courses and the opponents become quite difficult to beat. Some of the later courses require you to memorize them so you know when you will hit the corners. Despite this though it never becomes frustrating as you seem to get a little further each time you play. The extra game modes also add a lot to the overall package. A great SMS game that deserves a place in your collection. It is one of my top five multiplayer games for the SMS and the best racing game for the system. 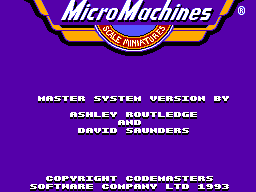 You can always trust Codemasters to create good looking, polished games for the SMS.